Build the ultimate bad movie! Fill the cast with stereotypical Characters, give your Characters Props, set your film (or somebody else's) in a Location, and attack other movies with Creatures. Spice things up with Special Effect cards. If your movie is worth the most points when the Credits are rolled (or at the end of the deck), you win! 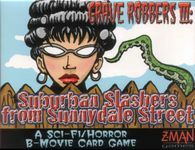 Grave Robbers III is an expansion and sequel to Grave Robbers From Outer Space and Grave Robbers from Outer Space 2: Skippy's Revenge, but can also be played on its own. Gameplay remains identical to the previous games in the B-Movies seres, except for the addition of the "Neighborhood" trait.